← What Are The Advantages Of The All On Four Dental Implant? For anyone who has considered dental implants as a way to replace their missing or damaged teeth in the past, there has always been a number of questions. The most commonly used form of dental implants has long been the variety which uses multiple posts to hold the prosthetic teeth in place. It is not uncommon for dentists to use as many as ten posts per set for standard implants. Today the all on four system can achieve permanent teeth replacement using only four posts per set. This is a vastly superior and far less painful procedure which offers a permanent solution for edentulous patients. Over the course of the past few years periodontists have noticed a trend in dental implants. This trend has been the steady deterioration of the jawbones in those who have had standard implant work done. This typically has involved the placement of up to ten posts to retain either the upper or lower set of teeth. Each time a post is implanted, it causes a minute amount of damage to the bone, as long as the number of posts is small, the bone will heal successfully. But when you have up to ten posts, in what is all reality a very small area, the bone can begin to slowly fracture and dissolve. Over the course of time the average patient may end up needing further surgery and bone grafts to restore the damage which has been done. This can be a very long and painful process. After years of research, periodontists such as Dr. De Andrade have found a far better way to provide patients with a full set of upper or lower teeth. Much like any structure supported by columns, implants need only have a small number of supports to be effective. What has been found is that successful implants can be more successfully achieved with proper placement of each post rather than with sheer numbers. Today the all on four implant uses two vertical posts at the front corners of the jawbone and two set at a 45 degree angle at the back of each side of the jawbone. 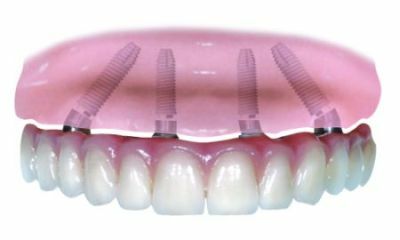 This simple change in technique makes the procedure far less painful and in most cases the patient will walk out of his appointment with a full set of teeth instead of waiting weeks for the multiple implants to heal. This has been hailed as a major advance in dental implant technology. This entry was posted in All On Four Dental Implant, Dental Implants, Periodontist and tagged anthem periodontics and dental implants, dental implants, dental implants in las vegas, dental implants las vegas, las vegas dental implants, las vegas periodontist, periodontist las vegas. Bookmark the permalink.